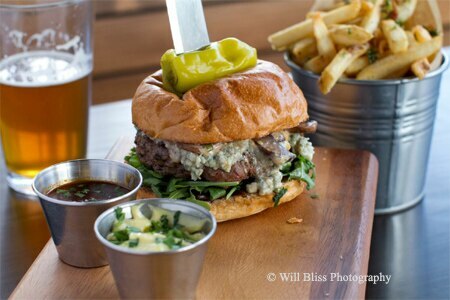 Downtown Johnny's is a Sherman Oaks sports bar/lounge serving up casual fare like the "Downtown Burger" topped with caramelized shallots, blue cheese and mushrooms. The space boasts six TVs behind the bar and two on the patio, plus a pair of 9-foot drop-down screens that will show games. Downtown Johnny's, 14649 Ventura Blvd., Sherman Oaks, CA 91403, 818-205-1616. LGO Hospitality has replaced Callahan's, a Santa Monica staple since 1946, with Ingo's Tasty Diner. The space now features cushioned black booths, a curved wood bar and paintings from local artist Sara Abbott. Executive chef Shaun Werth and baker/pastry chef Sarah Shifrin have teamed together on a farm-to-table, comfort food menu that typically includes burgers with grass-fed Strauss beef, rotisserie chicken with stewed chickpeas and Tuscan kale, and pan-roasted Campbell River salmon with herbed corona beans. However, the chefs shop at the Santa Monica Farmers Market every Wednesday and Saturday, so dishes are subject to change. Ingo's Tasty Diner, 1213 Wilshire Blvd., Santa Monica, CA 90403, 310-395-4646. April 30th marked the debut of Shatila Sweets in North Hollywood. Mike Shatila, whose family has achieved considerable success with Lebanese pastries and ice cream in Dearborn, Michigan, teams with Mike Haddad to replace a convenience store called G. Store & Gifts. The duo is making all baklava, mamoul, kashta, cookies and ice cream in a production kitchen in the same strip mall. Hayat Shatila, Mike's sister, co-owns popular Hayat's Kitchen with her husband in the same mall. Shatila Sweets, 11009 Burbank Blvd., North Hollywood, CA 91601, 818-505-8852. Short Order had a four-year run at The Original Farmers Market. Now, the two-story space makes way for Moruno, a Spanish restaurant from chef Chris Feldmeier and front of house partner David Rosoff, who worked together at Osteria Mozza and Campanile, along with the Sprout LA restaurant group. The ground floor will center on the pintxo Moruno, a Moorish-influenced kebab cooked over wood. Upstairs, guests will find Bar Vermut, devoted to Spain's spirit of choice, vermouth, plus drink-friendly conservas --- small bites built with preserved or canned ingredients. Moruno, The Original Farmers Market, 6333 W. Third St., 110, Los Angeles, CA 90036, no phone. The Hollywood & Highland Center is the site of the second California location for Grom. (The other branch can be found at Malibu Country Mart.) The Italian gelato company takes pride in using high-quality, natural ingredients and no added flavorings, colors or preservatives. Grom, 6801 Hollywood Blvd., Los Angeles, CA 90028, 323-873-2990. Neal and Amy Knoll Fraser, along with pastry chef Mariah Swan, have opened icdc, an ice cream, doughnut and coffee shop next to BLD. icdc, 7450 1/2 Beverly Blvd., Los Angeles, CA 90036, 323-930-9744. Restaurateur/chef partners Jon Shook and Vinny Dotolo (Animal, Son of a Gun) have opened another Fairfax restaurant called Jon & Vinny’s. The concept also features a wine store overseen by Helen Johannesen. Jon & Vinny's, 412 N. Fairfax Ave., Los Angeles, CA 90036, 323-334-3369. Chef David LeFevre and the Simms Restaurant Group (Simmzy's, Tin Roof Bistro) will open The Arthur J in the former Circa space in Manhattan Beach. This will be their third collaboration, following MB Post and Fishing With Dynamite. The Arthur J, 903 Manhattan Ave., Manhattan Beach, CA 90266, No phone. The upscale modern cantina, Toca Madera, is open in West Hollywood. It serves shared Mexican plates and fresh craft cocktails. Executive chef Raymond Alvarez’s “barrio-style fine dining” marries sustainable, locally sourced ingredients with traditional Latin flavors in dishes like cochinita pibil, tableside hot stone Wagyu, Ensenada-style fish tacos, Oaxaca empanadas and seared Chilean sea bass. The 4,500-square-foot restaurant includes a retractable roof and an interior patio. The 100-foot crystal quartz bar offers a large selection of tequilas and mezcals. Dinner Tues.-Sun. Wilde Wine Bar and Restaurant has replaced the old 3Twenty Wine Lounge on La Brea, and is focusing on boutique wines. Chef Nader Naderi dishes up a Mediterranean menu featuring wild mushroom ragu with polenta, skate with capers and brown butter, taglioni with fresh pine and pistachio pesto, and steak frites. Dinner Tues.-Sun.. Wilde Wine Bar and Restaurant, 320 S. La Brea Ave., Los Angeles, CA 90036, 323-932-9500. In Malibu, Nando Silvestri (Il Piccolo Ritrovo) has opened Tramonto in the former Giovanni’s Ristorante space. Expect pasta made tableside, house-made ravioli and lasagna, a gnocchi bar and probably more than a few celebs. Dinner Tues.-Sun. Tramonto, 22235 Pacific Coast Hwy., Malibu, CA 90265, 310-317-6769. Pasadena poke fans are excited about Spinfish Poke House, which serves a variety of Hawaiian raw fish bowls in signature styles (think ahi tuna with limu, Hawaiian sea salt, chili and green onion), and others that you can customize yourself. Spinfish Poke House, 36 W. Colorado Blvd. #7, Pasadena, CA 91105, 626-585-0988. Andrew Kirschner and partner Johnnie Jenkins (Tar & Roses) have opened SMYC (Santa Monica Yacht Club.) Housed in the former La Botte space, yachty décor accompanies chef Walter El Nagar’s focus on seafood. Expect fresh oysters with yuzu mignonette, swordfish carpaccio and salt cod brandade fritters. Beyond seafood, there’s also lamb kebab and bone-in New York steak. Dinner nightly. SMYC, 620 Santa Monica Blvd., Santa Monica, CA 90401, 310-587-3330. A new location of the JINYA Ramen Bar chain has opened on Main Street in Santa Monica, with an outdoor patio. Expect the signature tonkotsu ramen, as well as spicy chicken ramen, gyoza, sushi rolls and tempura Brussels sprouts. JINYA Ramen Bar, 2400 Main St., Santa Monica, CA 90405, 310-392-4466. Belcampo Meat Co.'s second Los Angeles area location has opened in Santa Monica. (The company also operates a butcher shop and restaurant in downtown L.A.'s Grand Central Market.) Belcampo Meat Co., 1026 Wilshire Blvd., Santa Monica, CA 90401, 310-451-5750. Sweetfin Poké serves up Hawaiian raw fish bowls at the corner of Eighth and Broadway in Santa Monica. The menu, created by chef Dakota Weiss, features “designer bowls” of the beloved Hawaiian seafood dish including classic tuna, kale snapper, spicy yuzu salmon and mango albacore. You can also build your own bowl. Find sides like taro chips and house-infused teas. Sweetfin Poké, 829 Broadway, Santa Monica, CA 90401, 310-395-1097. B.S. Taqueria, a project from chef Ray Garcia (Broken Spanish) in the former Mo-Chica space in downtown Los Angeles, is open for lunch weekdays and dinner nightly. B.S. Taqueria, 514 W. 7th St., Los Angeles, CA 90014, 213-622-3744. Ox & Son in Santa Monica is a modern American restaurant from the FNA (Fork n' Awesome) Hospitality Group (The OP Cafe, Ashland Hill, Art's Table). Executive chef/partner Brad Miller presents twists on classics, such as chicken fried duck confit. Ox & Son, 1534 Montana Ave., Santa Monica, CA 90403, 310-829-3990. Neal Fraser’s Redbird is now serving lunch downtown, Tuesday through Friday, with dishes like Thai-style Dungeness crab soup, hangar steak and a cheddar cheeseburger. Redbird, Vibiana, 114 E. Second St., Los Angeles, CA 90012, 213-788-1191. Pez Cantina, the coastal Mexican spot from Patina alum Bret Thompson, now offers Sunday brunch. Expect traditional Mexican breakfast and some luxe offerings, alongside a Bloody Maria bar. The patio should be an ideal DTLA summer brunch spot. Pez Cantina, 401 S. Grand Ave., Los Angeles, CA 90071, 213-258-2280. The Larchmont celebrates its two-year milestone by opening the doors of its Craftsman-style bungalow for brunch Saturday, May 2. Executive chef Kevin Kathman’s contemporary California menu will include deviled eggs with smoked whitefish, caviar and Meyer lemon; the “Stoner” with peanut butter crunch French toast, maple bacon and roasted banana --- with an option to add foie gras --- and “King Crab” with butter-poached crab, Béarnaise, crispy potato and poached eggs. Brunch hours will be Saturday and Sunday from 10:30 a.m.-3 p.m. The Larchmont, 5750 Melrose Ave., Los Angeles, CA 90038, 323-464-4277. Murph's in Sherman Oaks has shuttered and has been replaced by Downtown Johnny's. Murph's, 14649 Ventura Blvd., Sherman Oaks, CA 91403, no phone. 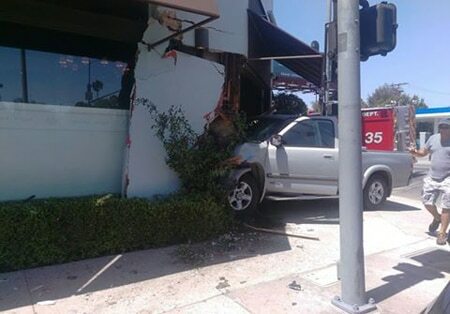 Nancy Silverton, Mario Batali and Joseph Bastianich had an unexpected guest the morning of Saturday, April 18th: a pickup truck slammed into the front door of Osteria Mozza, leaving one person injured. We hope the employee will recover quickly. The restaurant has re-opened. 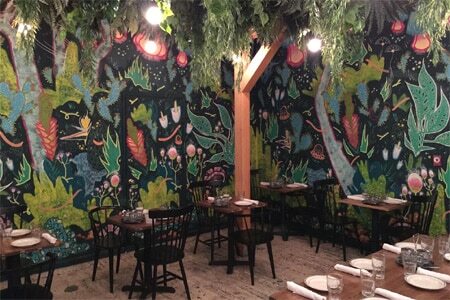 Osteria Mozza, 6602 Melrose Ave., Los Angeles, CA 90038, 323-297-0100. Trendy WeHo steakhouse STK is closing its doors on La Cienega and moving to the W Los Angeles Westwood hotel later this summer. STK, 755 N. La Cienega Blvd., West Hollywood, CA 90069, 310-659-3535. After 30 years, rising rents on Abbot Kinney are forcing Venice neighborhood favorite Hal’s Bar & Grill to close in May. The owners of the restaurant hope to relocate nearby. Hal's Bar & Grill, 1349 Abbot Kinney Blvd., Venice, CA 90291, 310-396-3105. Pasadena’s Mediterranean burger (and belly dancing) spot, Burger Continental, has closed after 45 years of business. Burger Continental, 535 S. Lake Ave., Pasadena, CA 91101, no phone. The glamorous restaurant and lounge Acabar has closed. Acabar, 1510 N. Stanley Ave., West Hollywood, CA 90046, no phone. In Venice, the iconic Rose Café has temporarily shut down for renovations as restaurateur Bill Chait takes over ownership. Jason Neroni (formerly of Superba Snack Bar) will helm the stoves once it reopens in Summer 2015. Owner and chef do not plan to change the basic concept of the long-beloved neighborhood café, and the mural will also remain. The Rose Cafe, 220 Rose Ave., Venice, CA 90291, 310-399-0711.